We are located at 4080 W 11th Eugene,OR. We have a show room full of the latest, top brands of stereos, alarms and equipment to get your auto or boat set up the way you want. Let us install it right for you. Summertime is in full swing! It’s time to peel back those boat covers and hit the waves! Nothing beats a hot summer day like taking your boat out, enjoying the water, your family and friends and snacks and music! Is your boat’s audio system the same system that was installed when you bought the boat? Are you wanting to switch out your tired audio system for a new system with modern usage? 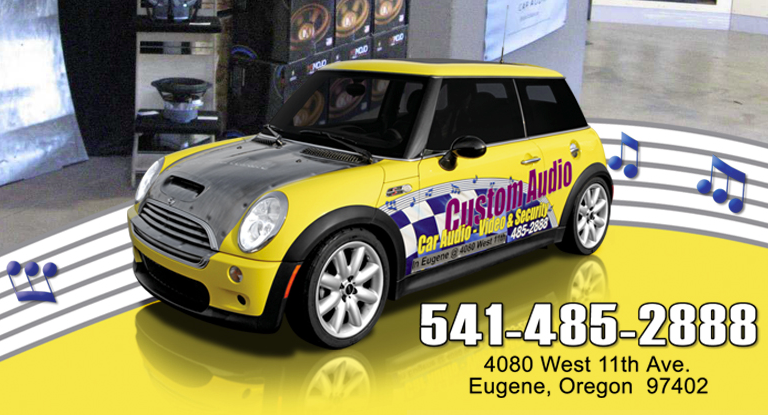 Here at Custom Audio, Car Audio – Video & Security, we are dedicated to listening to your audio needs, showing you our audio systems that would best fit those needs and flawlessly installing the product. Our trained salesmen can go over the different Marine Audio System choices and talk about the different benefits of each one. Not understanding the Audio System jargon in the catalogs? Our patient staff will help guide you through the catalogs in order for you to pick the right one for you! 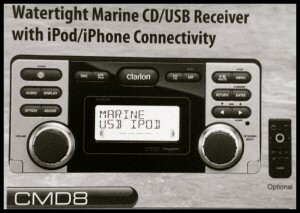 This popular CMD9 receiver is specifically engineered to resist salt water! It has been tested and certified in protection against water intrusion and is highly resistant to salt. The integrated drainage channels keep the water from damaging and aging your system. This is definitely a durable system you can count on to withstand extreme marine terrains. It also has iPod and iPhone connectivity. This incredible CMD8 receiver seamlessly supports all of your media preferences whether it be an iPod, iPhone, CD, MP3, WMA digital audio files on a disc or USB memory! The M303 provides you with a hands-free calling and stereo audio streaming with it’s built in Parrot Bluetooth module. It’s compatible with Pandora internet radio and has a rear USB port with iPod and iPhone audio direct connect. This has compatibility that allows for control via the boat’s multi-function display. There’s rear vision camera composite video input. The system is SiriusXM-Ready, which means it will provide a fully integrated satellite radio experience. 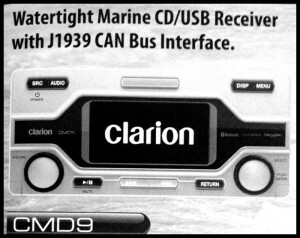 Clairon’s CMS5 acts as a source unit as well as a hub. It has all the necessities including AM/FM/Weather Band radio and is USB and iPod friendly. The brand new CMG speaker and subwoofer series comes in 6 1/2″, 7″ and 10″ sizes, all water resistant. The new CMQ speaker series comes in 6″ X 9″, 6 1/2″, and 10″ and are also all water resistant.